Our gift collection is truly eclectic. From gourmet foods to stained glass, from arts & crafts to fine jewelry – if it’s produced within our coastal state, look for it at The Virginia Store. As you browse, please inquire about our products. We love our state, and love sharing it with you. The local companies and artisans who create the wonderful products we carry feel the same way. If you have special requests or wish to offer us suggestions for gifts or baskets, please let us know. In addition to personal checks, we accept VISA, MasterCard, American Express and Discover. For your convenience you may visit the Virgina Store seven days a week. Our hours are 9:30 a.m. to 5:30 p.m. Monday thru Saturday and 12:30 p.m. to 5:30 p.m. on Sunday. We love bulk orders! Need a large quantity of gifts for your business conference, family reunion, or any special occasion? Let us know what you need, and we’ll work with our suppliers to get you the best prices we can. The Virginia Store thanks you for your business and your referrals!! The Virginia Store ships merchandise nationwide via UPS on Tuesdays and Thursdays. We recommend that customers do their own shipping for items being sent out of the country. **Charges are applied according to delivery time, weight and distance**. 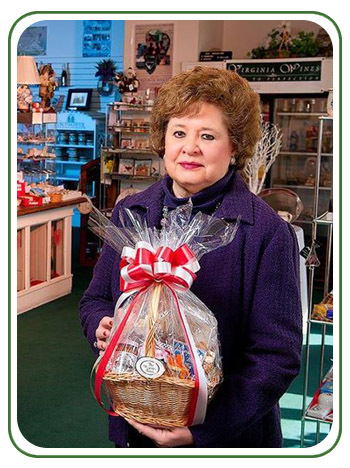 The Virginia Store truly offers “Virginia Gifts for All Occasions” – weddings, baby showers, thank you, get well, sympathy, hostess, new home, new office, etc.